In today’s uncertain age, Únětice Brewery offers a permanent solution in the form of a stable currency based on beer index. This guarantees that your beer won’t rise in price anymore, regardless of inflation. It can work as a form of retirement insurance too! All of this in provided by our Únětice Ounce (Úu). For every single Únětice Ounce you can get 0.5 l of Únětice beer everywhere, where it is tapped and this payment method is accepted. 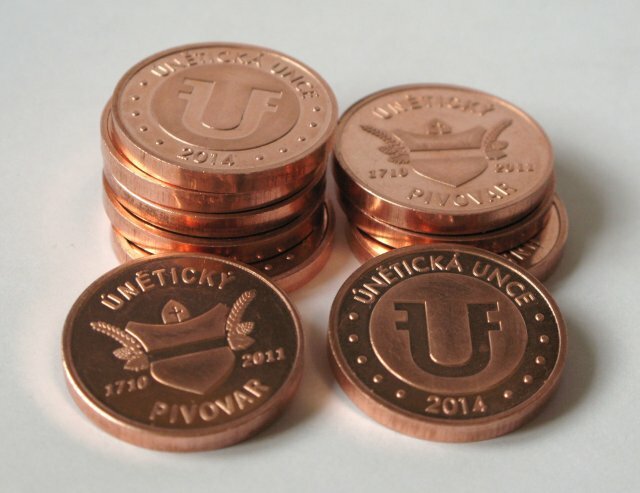 You can buy this minted copper coin for the current price of 0.5l Únětice 12° beer in the Únětice Brewery. The fact, that you can get your beer for the Únětice Ounce even after many year is guaranteed by Únětice Brewery. All of the coins are covered by the liquid gold stored in our cool tanks of the brewery.